Dhammapada is a John Mayer work that was commissioned by EMI in 1976 but remained unreleased for 30 years. 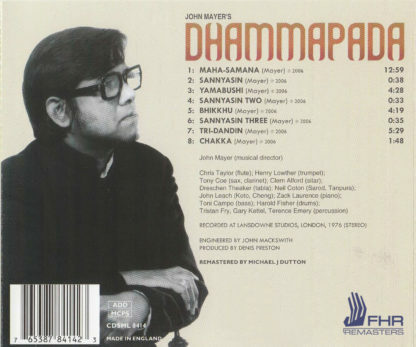 His work with Joe Harriott on Indo-Jazz Suite and Indo-Jazz Fusions is justifiably lauded, but Dhammapada expands on his East-West fusion by adding instrumentation not just from India (sitar, sarod, tabla) but also from Japan and China (koto and cheng, respectively) to his British jazz combo (sax/clarinet, trumpet, flute, piano, bass). In addition to drums and tabla, he utilizes a trio of percussionists who play everything from glockenspiel to marimba to temple bells. He also makes use of Japanese and Chinese scales in addition to his Indian classical influences. The results are amazing. 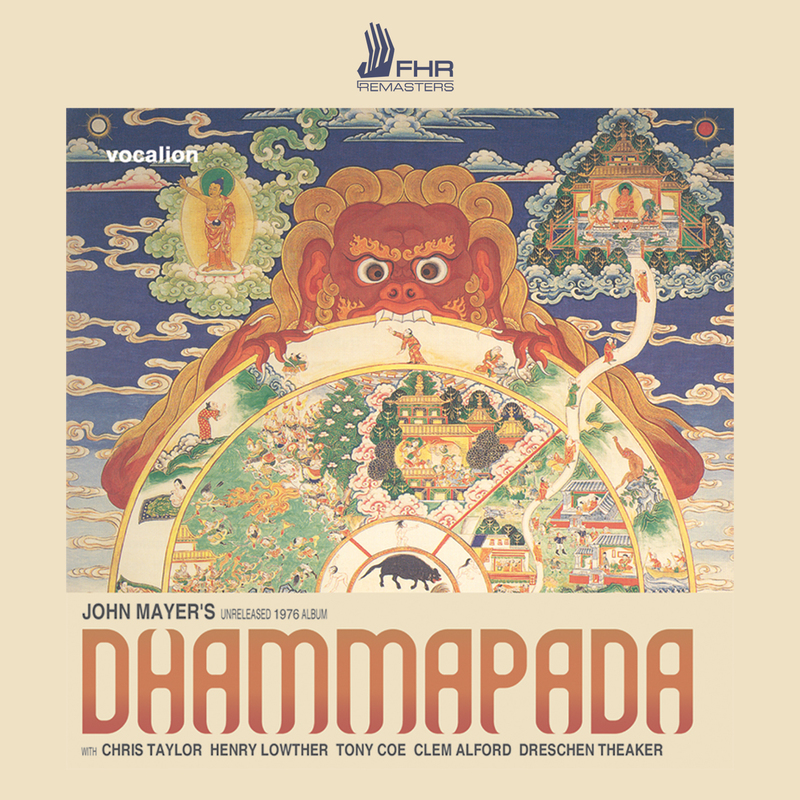 The seemingly odd instrumentation works surprisingly well together as an ensemble, and Mayer’s enormous talents as both composer and arranger really come to the fore. The longer pieces play like suites within a suite, with thoroughly composed sections seamlessly giving way to jazzy improvisational solos and musical conversations (for example, the trumpet/sitar dialogue on “Maha-Samana”) before the introduction of new themes. Mayer’s use of polyrhythms and counterpoint is fantastic and the band’s ability to transition from chamber ensemble precision to jazz-rock vamping is incredible. There are no lengthy solos to speak of; the playing is concise and extremely focused but everyone gets a turn. The longer pieces are separated from each other by progressively more elaborate arrangements of the same theme inspired by “Rag Kafi,” “Sannyasin.” Starting with just glockenspiel and crotales (basically bells), sax is added, then galloping bass and percussion. These pieces keep the album tied together nicely thematically, and also highlight Mayer’s arranging skills. The recording itself is also excellent — crisp and clear, taking full advantage of the stereo spectrum so each instrument is clearly identifiable with no muddiness in the mix (no easy task with a 13-piece ensemble). That this album sat unreleased for 30 years is almost a crime. It’s a brilliant, groundbreaking work that sounds fresh even after languishing for three decades. 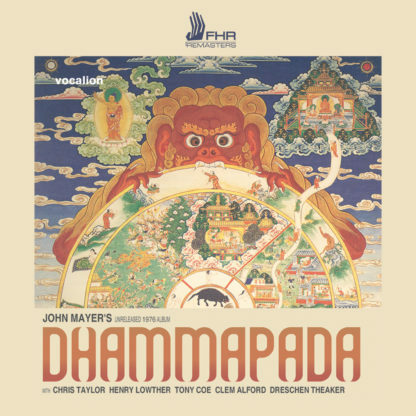 It’s a shame that Mayer didn’t live to see the eventual release of Dhammapada. It could well be his finest achievement.